What do Laurel and Hardy and 2000 rare books have in common with the University? 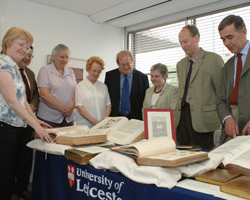 On Tuesday, 30th May the Centre for English Local History and the University Library welcomed two grandchildren of Thomas Hatton, an early benefactor of the University of Leicester. Christine and Paul Hatton were able to view examples from the nearly 2,000 rare books from the Hatton Topographical Library that their grandfather had donated to the Leicester, Leicestershire and Rutland College in 1920. This generous gift formed the nucleus of the University Library’s exceptional English local history collections. Thomas Hatton (1876 – 1943) led, by all accounts, a colourful life. Born in Manchester, he began work as a junior clerk in a corset factory in Market Harborough later moving to Leicester where he set up his own boot manufacturing business. He had interests in book collecting, crossword promotion, greyhound racing and boxing. On one trip to America he was photographed with Laurel and Hardy – all three men wearing the trademark bowler hat. He was a discriminating collector, acquiring the most significant county volumes in the finest condition and amassing over a period of ten years one of the best collections of topographical books in private ownership. His professional knowledge as a boot manufacturer was applied to his book collecting when he pioneered the use of glazed goat skin as a binding material. When his interests moved from topographical to Dickensian material, he agreed to donate his local history books to the College becoming one of the first of many public-spirited people who helped to establish what became the University Library. Christine and Paul were delighted to see for themselves the books their grandfather had chosen and to handle the same objects that Thomas Hatton had touched, some 90 years previously. The Hatton Collection forms part of the University’s Special Collections which are managed by Leicester Academic Library Services Ltd.